Austria Wien will play only 12 more games at their home Generali-Arena before relocating for two years. During that time the stadium will undergo a €42 million makeover. 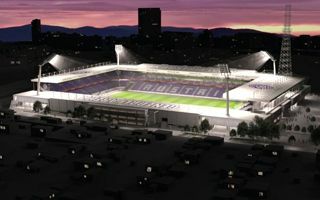 Planning permission granted, now Austria Wien may prepare for reconstruction of their stadium. In November the semi-open construction tender should be launched, then in early 2016 the financial framework will be completed. By April all proceedings should end, allowing works to begin after the 2015/16 season. Austria will then spend two seasons away at Ernst-Happel-Stadion, currently home to SK Rapid. They will only return in mid-2018, when Generali-Arena will house 17,500 people (15,000 for UEFA games) in a far more uniform and modern form. The price tag is expected to reach €42 million ($46m) for the stadium alone and further €6m for training and youth facilities. The project of Austria is very much unlike that of rivals Rapid. It’s a gradual and only partial reconstruction rather than a completely new stadium. It might also not be equally big, but Austria assure they have an advantage. Their home ground is expected to be more of a sustainable arena. Its own water treatment plant and roof covered in photovoltaic panels should give it domestic superiority in terms of environmental friendliness.